The Premiere Manufacturer and Direct Supplier of Cabling and Connectivity Products. The Cablexa 100GBASE-SR10 CFP module supports link lengths of up to 300m and 400m, respectively, over laser-optimized OM3 and OM4 multimode fiber cables. 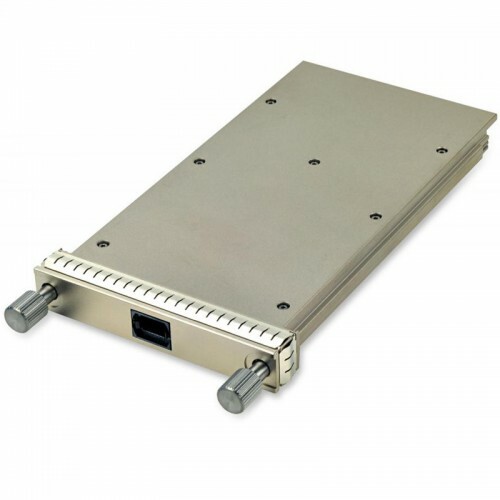 It enables high-bandwidth 100 Gigabit Ethernet optical links over ribbon fiber cables terminated with female MPO/MTP 24-fiber connectors. MDIO digital diagnostic and control capabilities. This CFP-100G-SR10-150M is marked and labelled with Cablexa brand as default. Customized labelling and branding are available as request. Cablexa offers 5-year limited warranty on this CFP-100G-SR10-150M optical transceiver module. Cablexa offers a large selection of optical transceivers that are compatible with all the major brands. We also carry transceivers in various form factors to meet your networking needs. Now you have a reliable, compatible and affordable means to expand your network while maintaining its integrity. All of Cablexa's transceivers are tested for 100% functionality and guaranteed compatible for outstanding network performance. This Cablexa CFP, 100Gb/s, 100GBASE-SR10, MMF, 850nm Band, 24 fiber MPO, 150M Transceiver Module is 100% MSA compliant. It is guaranteed compatible with your router or switch. And it comes with a 5-year warranty and lifetime technical support. If you have any questions about this CFP-100G-SR10-150M transceiver module or any other item, feel free to contact us. Copyright © 2008 - 2017 Cablexa Ltd. All Rights Reserved.